Sometimes the answer is “yes, we have it” and sometimes it’s “no we’re all out of grilled chicken.” So how does a business plan to be profitable on not having one of the key products they’re selling during the dinner hour. I actually drove through at 5 p.m. so it’s not like I came in late into the dinner hour for them to have run out of chicken. I don’t get it….can someone explain it to me please! The clerk is always very nice and apologetic when they run out but it’s a 50/50 coin toss if they’re going to have the product I want when I drive there. Unfortunately for KFC, there are about 5 other chicken places within a 3 mile radius that don’t ever run out of chicken. Popeye’s, although only fried, seems to only run out on their crazy $4 specials (10 pieces for $4) on Tuesdays. The other places are ethnic restaurants that grill chicken a variety of ways and most often taste better than KFC. So I decided to check out the YUM stock chart and see if I could figure anything out and lo and behold, I found something interesting! 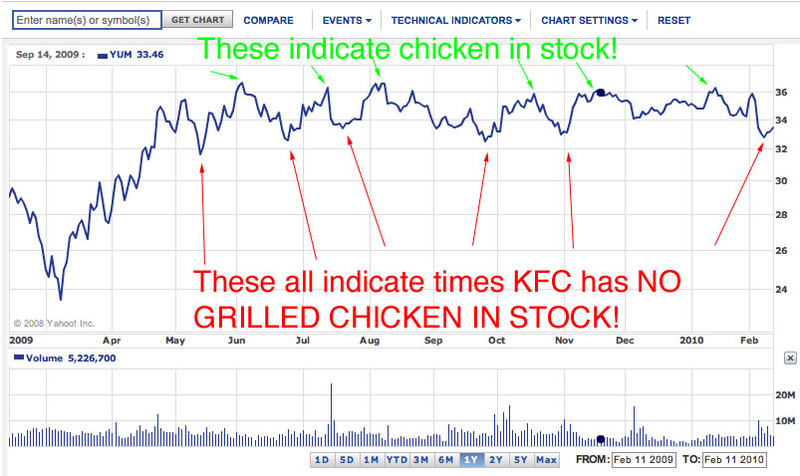 Anytime I drive by to buy grilled KFC chicken and they have none in stock, I don’t buy anything and drive away thus the stock plunge. 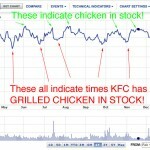 When they do have chicken in stock, I buy some and the stock climbs up! EUREKA! Someone give me a $5 million dollar salary and bonus please I’ve solved the sales problem! The KFC that used to be closest to my house is notorious for running out of chicken. I do not understand it at all. Of course, they are also notorious for having terrible service. The time before last, they were out of what I wanted to order (supposedly the cook had just quit moments before). The cashier was pretty rude about the whole thing, and I ended up just getting something else there since we were short on time. The last time I went, they actually had the chicken… sorta. They said one flavor of boneless bbq wings did not even exist when it was advertised on their website. Anyway, I made a substitution with something that they did say they had. But then, the girl didn’t understand I wanted the ‘meal’ and not just the bucket of chicken. Rather than canceling out the order and putting it in properly, she said she would just “make it even up” by charging me for one large side and giving me the two you are supposed to get. It actually came out a couple dollars cheaper, but as a result, I of course had no biscuits in it when I checked the bag. I told the (different) person that I needed biscuits and they looked at my receipt (a bad sign showing they don’t trust the customer) and started to say that I did not have biscuits on there. I explained the situation briefly and they acquiesced. I have pretty much vowed never to go back to that KFC and I should not have a hard time since it is no longer the closest one to my house. Well that’s part of the reason I rarely eat fast food. Poor quality, poor service, and bad ingredients! We also rarely eat out and decided to treat ourselves this evening with KFC. We ordered on line, received a confirmation number and immediately got a call saying they were out of chicken because of an accident on the highway. new flash!!! there is more then just one way into a city of more than 500,000 residents. we won’t be back, there are lots of other choices.